Juni zu der Auftakt-Veranstaltung mit Minoo Kajeh Aldin 26 Interessierte nach Ostrittrum gekommen, wollten sich diesmal 16 Kunstfreunde mit Behrouz Naghipour unterhalten, der aus den Niederlanden angereist war. „Der Kontakt kam durch Minoo Kajeh Aldin zustande“, berichtete Hollmann. Der Iraner spricht kein deutsch und nur wenig englisch, so dass seine Aussagen übersetzt werden mussten. Deshalb setzte er selbst auf die Sprache der Musik und spielte auf der Sitar. The world does not belong only to the West anymore. The East has many things to offer in the field of art and artists from that region have increasingly set the pace/criteria for contemporary art. Behrouz Naghipour is one of these artists; he left his country in 1990 and has lived in the Netherlands ever since. Living in an open society has given him this opportunity to devote himself to art and has helped him discover many possibilities in painting, photography and music; art has become an indispensable part of his life. If we study his work chronologically, we realize that it starts with figurative painting, but forms in these works become so abstract that sometimes the difference between such forms and abstraction is barely discernable. This set of Behrouz’s works is done in etching form or paintings on canvas. We face an intellectual artist who becomes involved with philosophy through painting. We might be able to interpret this set of works by their autobiographical attributes. Man fights with his inner world while dealing with general concepts of psychology and philosophy and its reflection back upon him and on the artwork itself. Behrouz himself says that his works are, “portraying the human’s inner secrets and concepts such as life, death, love, hate, faith, sorrow, joy, weakness, strength”. In these paintings we see ordinary human figures or elements from nature that have been de-familiarized by their placement within an unrealistic context. This is surrealism that changes the common habits of vision and shakes ordinary thought. The themes of these works are mostly what could be characterized as graphic exposés of human inner conflicts and the artist’s thoughts and philosophical challenges. The next generation of his work began in 2000 and shows more abstraction. Behrouz says about this body of work: “I draw myself into the impact of the role of color, line, texture, composition, structure, contrast, balance and…. on a white surface of the canvas, since each element of it has so many untold stories”. One of the features of Behrouz’s work in this period is the formal use of calligraphic language and the questioning the substance of religious, cultural and historical beliefs. These traits have much in common with characteristics of artists who lived in Eastern Europe in the 1980s and set their work apart from their contemporaries, somehow giving individuality to the contemporary modern painting styles. Behrouz Naqhipour creates a unique visual world by, on the one hand, utilizing Islamic pictorial conventions and graphics, Persian calligraphy, the typical colors used in Islamic art such as green turquoise and azure blue, and challenging the West’s visual language on the other. He not only uses the elements of his homeland artistic traditions in his work but also considers those of western painting. By using Persian calligraphy to create a new connection in these series of works, he still keeps a distance from his native culture but does not allow himself to be suppressed by the influence of western forms and culture either. He uses indigenous Islamic and Persian symbols and Ornaments, but that does not entail that he reproduces elements of Persian culture in his artwork in their exact form. Instead, he analyzes these elements and comes to new connections and graphical signs that change the former meaning of them. With his approach, Behrouz achieves a visual language interface that can be understood by today’s generation and is highly relevant to contemporary art worldwide. He removes the philosophical, religious and cultural elements from their usual context and expresses them in a completely free form, playing with and trying out colors and materials. This de-familiarizing goes so far as to change the definition of typical Islamic color or traditional pictorial Or philosophical values of the East and involves us in new contemporary social-philosophical issues. It can be said that Behrouz’s abstract artworks, in addition to their eye-catching features, present a world of questions before us that is amazingly complex but accessible at the same time. Time in Behrouz’s artworks is unstable and ephemeral, and this concept is not just about time in a chronological sense, but in a chaotic/ immeasurable /urgent sense. Everything is happening right now. Such abstract notions are central to his abstract painting. According to the artist, “the content of my work derives from my personal impressions of the world around me: Past, present and future worlds; the world here or there; the world of my imagination”. Behrouz’s artworks break through the dimensions of space too. His world is not here or there but the one that his imagination constructs. Time and space therefore find their own reality in abstraction. He paints the ideas of time or space. Light in his works is not for determining the time of day but to bring us out of the ordinary dimension of time. This brings us closer to infinity which is as old as history; a history that is full of a bewildered man’s feelings and his inner world and states the passing of time and ancientness by using colors like brawn- ocher. The surface texture of the work evokes the manipulated essence of oldness. Some of these works have architectural personalities that place the viewer in front of an ancient civilization’s remains. Sometimes concepts such as honor, courage, strength and weakness are explored in a humorous way. This humor can be subtle and lies in the concept of these artworks and the only way for understanding this humor is to engage with the work and the artist himself. This gloomy humor, despite its darkness, may give the viewer a sense of relief as well. This is a kind of puzzle, which can be solved only by referring to oneself and a redefinition of everyday concepts. At very moment, Behrouz makes a puzzle for the viewer’s thoughts and feelings. These puzzles are not only the results of his abstract painting style – which inevitably has this characteristic – but are also derived from act of the artist’s conception. 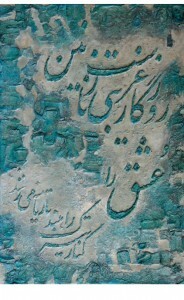 Persian poetry is written in English letters. This way of creation not only highlights and praises what is common but also becomes abstracted from the original artistic idea.Naghipour purges the form from meaning and concepts and transforms it to visual signs that can be read globally in the world of painting. 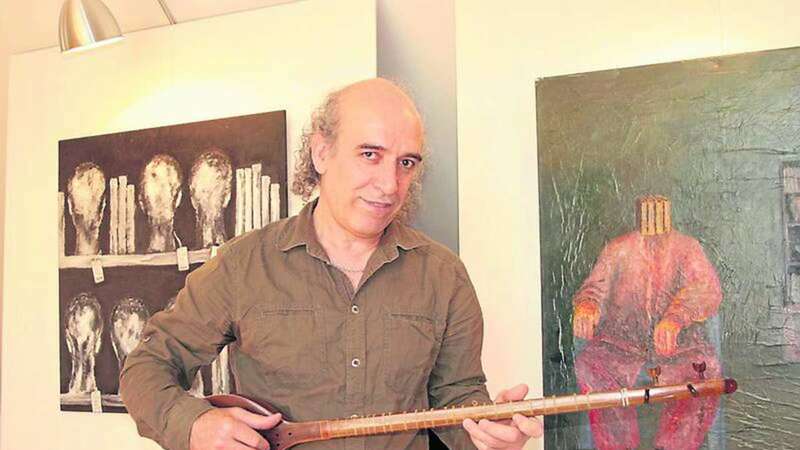 Behrouz Naghipour’s artworks are as old as the human being and the extent of his world. از سال های هشتاد میلادی به بعد با مهاجرت هایی که در سطح جهان اتفاق می افتد، تعداد زیادی از هنرمندان چینی، آسیایی و خاورمیانه برای یافتن آزادی و شرایط مناسب برای فعالیت هنریشان به سوی غرب حرکت می کنند. این واقعه موجب بده بستان فرهنگیی می شود که تاثیراتش بر فرهنگ غرب دیگر بارز تر از آنست که بتوان نادیده اش گرفت. گاهی موفقیت این هنرمندان چنان عمق و ابعادی به خود می گیرد که هنر غرب را به کنکاش وا می دارد. جهان دیگر جهان یک سویه ی غرب نیست. شرق در عرصه ی هنر حرف هایی برای گفتن دارد که خود کم کم به معیارهای سنجشی برای هنر تبدیل می شود. بهروز نقی پور یکی ازین هنرمندان است او سال 1990 کشورش ایران را ترک می کند و درهلند اقامت می کند. فضای بازغرب به او این امکان را می دهد که تمامن خود را وقف هنر کند و ازین راه به ابعاد و امکانات گسترده ی نقاشی و در کنار آن عکاسی و موزیک دست یابد و ازین طریق هنر برای او به ضرورتی تبدیل می شود که از زندگی او جدایی ناپذیر است. اگر بخواهیم به آثار بهروز به شکل تاریخی نگاه کنیم در آن روندی می یابیم که آغازش با نقاشی فیگوراتیو است. اما فورم ها در این نوع از کارهای بهروز به حدی آبستراهیرن می شود که گاهی به مرز آبستراکسیون می رسد. این سری از کارهای نقی پور یابه شکل اچینگ و یا نقاشی روی بوم اجرا شده اند. ما در این کارها با هنرمندی متفکری روبرو هستیم که با نقاشی به فلسفه می پردازد. این سری از کارها شاید بتوان گفت ویژگی اتو بیو گرافیک دارد. در گیری انسان با دنیای درون خویش از یک سو و از سوی دیگر پرداختن به مفاهیم کلی روانشناختی و فلسفی و بازتاب آن در خود و در اثر. بهروز خودش در این مورد می گوید: « به تصوير کشيدن رازهای درونی انسان و مفاهيمی مثل زندگی، مرگ، عشق، تنفر، اعتقاد، غم، شادی، ضعف، قدرت …» در این کارها ما فیگورها ی انسان یا عناصری از طبیعت را می بینیم که بطور واقعی نقاشی شده اند اما از آنجایی که در کنتکسی غیر واقعی قرار می گیرند، از آن ها آشنایی زدایی می شود. این ویژگی سورالی است که عادت های بینایی و فکری معمول را تکان می دهد و گاه به هم می ریزد. تم این کار ها عمدتن درگیری های انسان با درون خود و نوعی به تصویر کشیدن اندیشه ها و کنکاش های فلسفی این هنرمند است. دوران بعدی کارهای او که عمدتن از سال ۲۰۰۰ شروع می شود نظر به انتزاع دارد. بهروز در مورد این دوره از کارهایش چنین می گوید: «خود را به تأثیر نقش حاصل از رنگ، خط، بافت، ترکيب، ساخت، کنتراست، بالانس و . . . روی صفحة سفيد دوک می سپارم. چرا که هر ذره از آن هزاران راز نا گفتة درونی را در بر دارد.». از ویژگی این دوره از آثار بهروز نقی پور وارد کردن عنصر خط ، زبان در فرم و بزیر سوال بردن مفاهیمی چون عقاید دینی، تاریخی و فرهنگی به لحاظ محتواست. این ویژگی ها دقیقن با ویژگی هنرمندان شرقی ساکن اروپا در سال های ۸۰ همسو است که کار این هنرمندان را از معاصران خود مشخص می سازد و به نوعی به یکی از سبک های نقاشی معاصر شخصیت می بخشد. بهروز نقی پور با سود جستن ازنقش و نگار های اسلامی، خط فارسی، رنگ های تیپیک اسلامی مثل سبز تورکیس، فیروزه ای، آبی لاجوردی از یک سو و از سوی دیگر به چالش کشیدن زبان تصویری غرب جهان تصویریی می سازد که منحصر به فرد است. او ازین طریق نه تنها عناصر هنری کشور بومی خود را در کارهایش دخالت می دهد بلکه المان های نقاشی غرب را از نظر دور نمی دارد. او دراین سری از کارهایش با به کار بردن خط فارسی در فرم درارتباطی جدید در عین اینکه از فرهنگ بومی خود فاصله می گیرد اما در فرم و فرهنگ غربی نیز حل نمی شود. او از دیدگاه هنربومی حرکت می کند اما این بدان معنیا نیست که عناصر تصویری را به عین از فرهنگ فارسی وارد نقاشی هایش می کند بلکه از طریق برخودی تحلیلی به آن ها به ارتباط ها و نشانه های تصویری نوینی دست می یابد که معنای سنتی این عناصر بومی را تغییر می دهد. او ازین راه به زبان تصویری میان فرهنگیی دست می یابد که برای انسان جهان امروز می تواند قابل دسترسی باشد. این موضوع به کارهای نقی پور ویژگیی فرا مرزی می دهد. پرداخت بهروز به موضوع های فلسفی، مذهبی، فرهنگی نیز از کنتکس خود جدا می شوند و و در فرمی کاملن آزاد از طریق بازی و تجربه ی با رنگ و مواد بیان می شوند. این آشنایی زدایی تا حدی پیش می رود که درک تعریف شده از رنگ ها ی مشخص اسلامی یا شرقی ارزش های سنتی به هم می ریزد و ما را با سوال های فلسفی ـ اجتماعی نوینی درگیر می کنند. می توان گفت که آثار آبستره ی بهروز فزون بر عناصر زیبایی شناسانه اش دنیایی از سوال و کنکاش را به روی ما باز می کند که گاهی بطور شگفت انگیزی پیچیده اما در دسترس است. آثار بهروز ابعاد مکان را نیز در هم می شکند. دنیای او نه اینجاست و نه آنجا بلکه دنیاییست که او در خیال به آن سفر می کند. به این ترتیب زمان و مکان در انتزاع واقعیت خود را می یابند. او زمان و مکان را به تصویر نمی کشد بلکه ایده های این مفاهیم را به تصویر می کشد. نور در کارهای نقی پور برای تعیین ساعت روز نیست بلکه به ما این امکان را می دهد که از ابعاد زمانی ملموس بیرون آییم و به زمانی بی پایان و به قدمت تاریخ نزدیک شویم. تاریخی که سراسر داستان حس ها و دنیای درون انسان سرگشته است. تاریخی که با استفاده از رنگ های اخرایی ـ قهوه ای گذشت زمان و کهنگی را الغا می کند. بافت Texture کار ماهیتی دستخورده، دستکاری شده و موزه آل به خود می گیرد. استفاده ی از پاپ ماشه که خود ماده ایست قدیمی به کاراکتر تاریخی تاکید می ورزد. تعدادی از این کارها شخصیتی معمارگونه architektual دارند که بیننده با نگاه کردن به آن خود را در مقابل خرابه های باستانی یک تمدن می یابد. مفاهیم همچون افتخار، شجاعت، قدرت و ضعف گاهی به گونه ای طنز آمیز به کنکاش گرفته می شوند. این طنز در مفهوم این آثار نهفته است که فقط از راه درگیر شدن با آن ها و به تبع آن با خود هنرمند قابل درک است. طنز سیاهی که دراوج جدی بودنش شاید حس سبک شدن به بیننده می دهد. نوعی معما که برای حل آن فقط باید به درون خود رجوع کرد و مفاهیم روزمره شده را بار دیگر از نو تعریف کرد. او هرلحظه معمایی برای حس و اندیشه ی بیننده طرح می کند. این معما ها نه تنها در سبک نقاشی او که به دلیل آبستره بودنش خواه ناخواه این ویژگی را داراست بلکه در نحوه ی پرداخت کارهایش نیز ملحوظ می دارد. شعری فارسی با حروف لاتین روی بوم نقش می بندد.این نوع پرداخت نه تنها هر لحظه از آنچه که معمولیست خرق عادت می کند بلکه از نظر ایده ی هنری نیز به انتزاع می رسد. در اینجا هم بیننده ی بومی و هم غیربومی با «مسئله ای» روبه روست که به دلیل آبستره بودن کار فقط از راه حس می تواند به آن نزدیک شود یا به آن دست یابد. نقی پور ازین راه فرم را از معنا و محتوا خالی می کند وآن ها را به نشانه های تصویریی تبدیل می کند که در دنیای نقاشی جهانی می شوند. می توان گفت که کارهای بهروز نقی پور به قدمت انسان و به وسعت جهان این انسانند. mijn innerlijke raadsels te kunnen verbeelden. Het duurde niet lang tot mijn verlangen veranderde in stille wanhoop. Kon ik in mijn kindertijd mijzelf beoordelen, nu werd ik beoordeeld door een dwingende omgeving met een eenzijdige en fundamentele visie. Mezelf vrij maken van deze sfeer duurde heel lang. Toen ik kennis maakte met een maatschappij waarin kunst onafhankelijk en vrij is, werd verborgen inspiratie en motivatie wakker in mij. Ik bleef zoeken en in een hogere sfeer onder invloed van stilte en muziek gaf ik me meer en meer over aan de patronen en beelden op het witte doek die ontstaan uit kleur, verf, textuur, compositie, structuur, contrast en balans. Het weergeven van mijn gedachten en gevoelens is nu opnieuw een zoektocht geworden nu ik met open blik kijk naar al mijn ervaringen in kunst en van daaruit nieuw werk laat ontstaan. En elk aspect en elk fragment bevat duizenden niet vertelde raadsels. Ik maak gebruik van gemengde technieken waarin ook tekst een rol heeft. bijzondere plekken zoals een AZC of een gevangenis, school of organisatie te werken. Daarnaast spreekt het me aan dat ik als professionele kunstenaar met een andere culturele achtergrond middels dit project kans krijg om een bijdrage leveren aan het verrijken van de interculturele samenwerking binnen deze maatschappij. بهروز نقي پور با لهجه ي كرمانشاهي، فارسي حرف مي زند و وقتي كه بحث هنري در مي گيرد واژه هاي هلندي اينجا و آنجا در ميان كلامش به گوش مي خورند. در اين ميان من و نقي پوربه خيابان هاي پر رفت و آمد ليندن نزديك مي شويم. او را به سوي پارك كودكي كه در خيابان اشتركه اشتراسه قرار دارد هدايت مي كنم تا نظرش را در مورد آثار هنري كه در اين پارك كودك قرار دارند بپرسم. بچه ها با رنگ پوست، سن و مليت هاي مختلف باهم مشغول بازي هستند. پدر و مادر ها با لباس هاي رنگ و وارنگ كه خبر از عقايد و باور هاي متفاوت مي دهد دور ميز كاشيكاري شده اي نشسته اند و مشغول گپ و گو هستند. بهروز نقي پور شادي كودكانه اي بروز مي دهد و در حاليكه ديگر چندان جدي به نظر نمي رسد مي گويد: « صحنه ي جالبيه. من تا حالا توي اروپا چنين صحنه اي نديده ام » و بلافاصله اضافه مي كند: « ولي اخيرا هنر در اروپا به خدمت آموزش و مقاصد اجتماعي گرفته مي شود ودر چنين پروژه هايي هنر به عنوان هنر نا ب فراموش مي شود. حيف كه همه جا بودجه هاي مالي براي هنر حذف مي شوند و درست زماني كه جهان نياز به آن دارد يعني زماني كه بحران هاي مالي و اجتماعي اوج مي گيرد، اين اتفاق روي مي دهد. در اين ميان به ليند نر ماركت پلاتز رسيده ايم. بهروز نقي پور نگاهي سريع به صفحه ي تلفن دستيش مي اندازد و از اين راه به من مي فهماند كه زمان، زمان رفتن است. موضوع زيادي وجود دارد كه مي خواهم با او در موردشان صحبت كنم. مثلا اينكه: « آيا هنرمند يك انسان جهان وطن است؟» اما بهروز نقي پور راه درازي تا «كريمپن آن دن اييسل» در پيش دارد.